Xenicibis xympithecus is an extinct flightless ibis from Jamaica that had an incredibly rare adaptation — it used its wings as clubs. Unlike most flightless birds whose wings turned to vestigial and useless stumps, the Jamaican flightless ibis retained extremely long wing bones, but they adapted into use for attack. The wing had a long, curved, banana like structure, with a narrow base and heavy tip. It also had a special joint, which allowed it to be smashed downwards at high speed like a club. While doubtless used for defense, as the ibis evolved its flightlessness on an island filled with predators, it's thought the club wing was used against other members of the same species, as evidenced by the high number of fractured bones found in the skeletal remains. 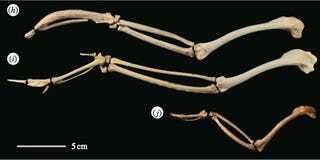 This is the only known example of a vertebrate adapting a limb into club.